To all readers, I wish to share an online debate I had with a person named Al Francis Sotto. This person sent me an email via my facebook account last December 17, 2011 and it seems he sent the same question to others who are Catholics like me defending truth, but since I do not often visit my Facebook, it was only last February 22, 2012 that I was able to debate with him which he in return replied immediately. Hi Al, I just saw your email and to my surprise, December 17 pa pala ito. Anyway, let me answer your question based as well from the same reference you have. The early Church defines certain beliefs and situations to easily identify what is spoken about with a single word. It is similar as “Trinity” though the Bible does not mention the word, it is a word needed to simply address the fact that there is One God in three divine persons. However, unlike Trinity, Limbo never became a doctrine, or even a dogma. It only reached the stage upon which theological issues are being addressed to clarify the Christian faith. And Limbo as tested by scripture, tradition, and other scholarly point of view, never passed and never will be. Here, you will see that at some point in time, some leaders of the Church supported it while others didn’t. As I pointed out before, it was a theological discourse tested for its authenticity and truthfulness, in the end, it was proven to not pass. However, the Church continuously welcomes discussions about it like what you and I are doing now. The reason why the Catholic Church never supports the idea of limbo is because the Catholic Church already believes in Purgatory which is well supported by scripture. Second, it is unacceptable that infants who were born but died immediately is just floating in an unknown state due to original sin. The thing is that a person will not make it to heaven because of his personal guilt of sin, not the sin passed down by our first and original parents. After my response, he replied not really looking into the explanation but an entrapment through technicalities. He brought out questions that he only wanted me to answer with a yes or no but never to give an explanation why I answered a yes or no. I told him that limiting me to a yes or no will only make my response vague and in favor to how he wants the answer to mean. Yet he denies that he is limiting me to only what he wanted to lead me. One very good example of this approach was when he asked me if I admit that Limbo is a Catholic Doctrine. Definitely, by my point of understanding, I said “No”. The reason why I said “No” was practically obvious that anyone who has common sense will immediately understand, Limbo was never declared by any pope in the history of the Church that it is an official doctrine. On the other hand, I also answered “Yes” to the same question for the very reason that it was being considered a doctrine, but then again, after much test through theological discourses, it never did become sound in the sense of the Christian faith, therefore failing in all aspect to be considered as an official doctrine. And yet he forces to push on that it is a doctrine because of only one proof which in the first place did not go against what I just explained but reinforced it. 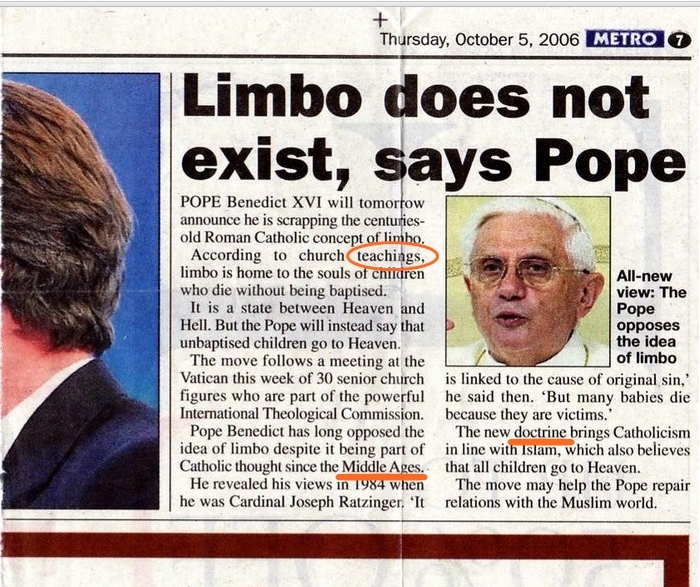 He attached a picture of his proof by inserting a newspaper article from Metro dated October 5, 2006 and encircled are his emphasis as shown below. Of course, I said, “Amen!” I did agree with the article. The doctrine never became a doctrine! That was what the article is saying making such scrapping off of that long time discussion show that is also in line with Muslim belief that all infants go to heaven as stated in the article. Apart from the discussion, I just wish to share that although all Muslims believe that infants who died go to paradise in the same way as the Catholic teaching, they also have a similar “Limbo” dispute they call “al-A’raaf” which is actually explained in detail in a Surah with the same name which is actually a place of judgment. This is entirely different from Purgatory which is a state where purgation happens to prepare the person for heaven. The Muslim difference of explanation depends to whether the child is a Muslim’s child or is a child of a Kuffar (or Kafir, a non-Muslim or unbeliever). Yet we have to note that Al-A’raaf is never the same to limbo as well. I am simply pointing out that Muslim scholars are also having some test of their own regarding their theology about infants who have died. But despite such, he continuously emphasized that this was before a Catholic doctrine being believed which was recently scrapped, therefore, making him conclude that Catholicism is a false religion due to such changes. To further support my argument, I asked him to show me references if there were any Pope, the main authority to bound or unbound a doctrine, have declared “Limbo” as an official doctrine of the Church. He failed to give any evidences on this but kept on with his article telling me that I am denouncing my pope because it was the pope who said it is a doctrine. His explanation was really a laughing matter but I pushed on. I said that the pope in the article he presented never even mentioned it as a doctrine. It was the editor who wrote the article who mentioned it to be a doctrine. But even though, I still admitted that Limbo was considered a doctrine within the Church but it was a doctrine that never held ground. In other words, the “Limbo doctrine” is in limbo and will never be an official doctrine even once in the history, present, or future of the one and only Bride of Christ, the Church. Al Francis Sotto from the very start told me that he is angry against those who do not have truth, but when he was presented with truth, he says it is an alibi just as any other Catholics he debated with. Apart from that, he limits his scope to only the direction he wishes even though he denies that as well. He kept on saying a lot of swearing words trying to topple down my dignity with his very harsh words, but I kept on keeping my composure and let his words bounce back to him, because his explanations and defenses does describe him according to the harsh words he was stoning me with. He wanted to take control of the debate and was making rules he wanted me to agree with and I did agree but I simply wish to know what denomination he came from, but he does not wish to say justifying that we already made an agreement. But the question I was asking is for me to know him and is not related at all to the agreement made. I just want to know his denomination, but it seems he is so afraid to tell me because maybe my questions later on will give him a very hard time to answer especially if I begin to relate it with whatever his belief may be. He feels he won the debate, and I just let him feel he won since that is the only glory he could achieve for himself, but truth does shine and he knows he never had it from the very start. Therefore, let him be angry on himself because from the very start, he did say he is angry to those who do not speak truth. Our discussions have not ended yet. When I begin to ask my own questions, he ignores it making it very obvious that he really wishes to control the discussion for fear of being trapped in the very trap he made with the words he has already dropped. And since he did challenge me, I am not the one following his time and his way of trying to control, but making him very impatient sure is exciting on my part because I have my composure and cool mind over his temperamental state. I always learned that an over-heating engine, when introduced with a cool vessel of water, the engine will surely crack. Teachings and doctrines are the same. and LIMBO is not really in the bible, there are many verses that can defend the statement of Sotto. Amen Ralph! I do not know if you have read the statement, which is why the Catholic Church have never declared anything as Limbo to be a teaching of the church and only a point of discussion due to the reason that it is unbiblical and against Catholic Tradition as well. This is the very reason why I posted this here because there was really nothing to debate about with Al Sotto, because his stand and the Catholic stand are the same, yet he forces that it was not and that at a point the Catholic taught it officially when it didn’t. Therefore, was really no point of discussion because we were debating on the same side rather than contrary. Apart from what I have mentioned, I just want to point out that doctrine is teaching, but not all teachings are doctrines. I’m still confused about the limbo thing, so what happens to all the innocent people who die before Christ? Where do they go? hello queenofhopes! There is nothing to be confused about limbo. Such a teaching was never and never will be part of any dogma of the Catholic Church. In short, those who have not known anything about God and God’s own Church and by it was never baptized still have the hope of salvation when they die as long as in many ways, they were inspired with grace during their lifetime to do what is morally good and right. As for the innocent children who died before they were administered baptism, the Church trusts that God has already granted them their salvation. But it is always good to pray for them who are already in God’s arms who are also praying for us unendingly.